Pink Castle Blog: Classes are starting again at Pink Castle! Classes are starting again at Pink Castle! This post will cater a little more specifically to our local friends but I wanted to share with all of you anyway! We have a new class coming to our shop (hopefully in our new location) featuring a new teacher! Anke Trampler will be joining us starting later this month for an introductory sewing class. This class will be a six-week long course that will cover the basics of machine sewing including fabric selection, reading and understanding patterns, pressing/pinning, interfacing, zippers, buttonholes, and all those other important steps required for successful sewing projects. It's a really great course covering tons of material! Anke will walk students through all the steps of the sewing process from prep work to finishing and in the process will help students complete four projects: an infinity scarf, a throw pillow with tassels, and a cute sleep set with lounge pants and an eye mask! You can save a spot for yourself or a budding sewist in our Modern Sewing Essentials class by clicking here under "General Sewing". 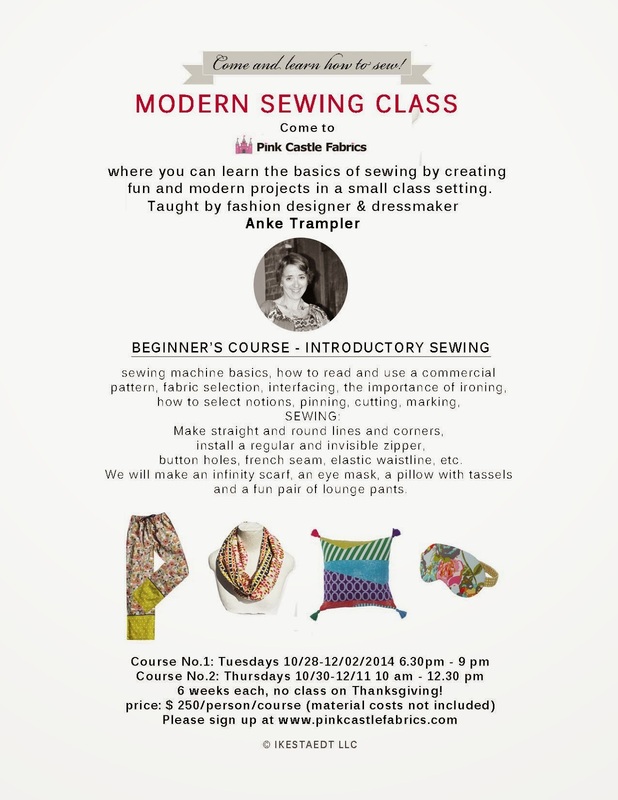 Feel free to share our flyer for the class too, if you know of some folks who may be interested in trying their hand at sewing!